I have been listening about some very good comments for this movie so I made it a point I watch it. In fact I got little more interested after I read Gauri Shinde’s interview on TOI. Anyways, the experience was much better than the last few films that I have seen lately. Story: Sashi Godbole the average simple Maharastrian home-maker and small time entrepreneur tries hard to keep everyone around happy. With the daunting task of being a wife, mother to a teenage girl and young son she finds herself in an uncomfortable zone with the husband and daughter because of her poor English skills. 5 weeks in New York for a relative’s wedding changes her life. To know who wins in the fight over language you’ll have to watch the movie. Sometimes simple goes unnoticed and people can be unaware what the other person feels about their comments even if they didn’t mean harm. Respect is all what a person wants from friends and family. A very real closer to earth story which can be a situation in many households. It was in fact a little annoying for me to see the protagonist being ill-treated by the daughter only because she can’t converse properly in English. But that’s what the movie’s all about. The classroom scenes in the ‘learn English in 4 weeks’ centre almost reminded me of Mind your Language. 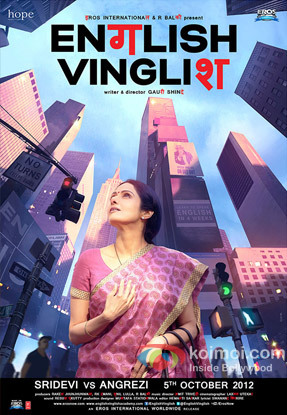 Gauri Shinde (director) makes a fantastic debut with an unconventional movie and a big thumbs up for her. I think it required rightfully an unconventional female director to give this kind of a movie. Coming to Sridevi – she is the backbone of the movie – predominantly it is a Sridevi movie. And she delivers quite effortlessly. Even after 15 years she comes and emotes like a pro. However, this time around she is with an ever sharper and slimmer nose and a very different voice. The music is okay and I quite liked the song Manhattan – obviously for the clever usage of brands. One thing you can never miss is the very interesting cameo by Big B. I quite liked the dialogue he gave to the immigrant officer in New York. Bravo to the team for a feel good movie. If I have to rate I’ll give it a 3.75 out of 5. I have heard about this movie but yet to see it. Nicely written review.